We said yesterday that the pace of earnings doesn’t pick up until today, and so far so good. Of the ten companies that have reported earnings this morning, nine have exceeded EPS forecasts and one reported results that were inline with expectations. No misses! While the revenue beat rate this morning hasn’t been nearly as strong (60%), it hasn’t been bad either. Those positive results coupled with a big rally in Asia overnight has US futures looking higher and the S&P 500 on pace for a new YTD high with all-time highs not too far away. 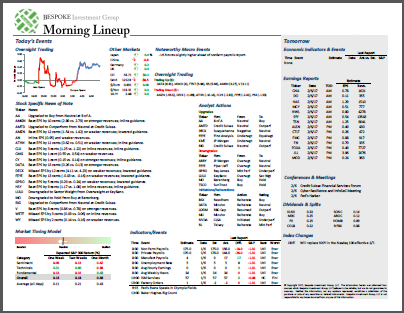 We’ve just published today’s Morning Lineup featuring all the news and market indicators you need to know ahead of the trading day. To view the full Morning Lineup, start a two-week free trial to Bespoke Premium. Equities in China had a good session with the Shanghai Composite rising over 2%, and on a closing basis, this was the highest close since March 2018. 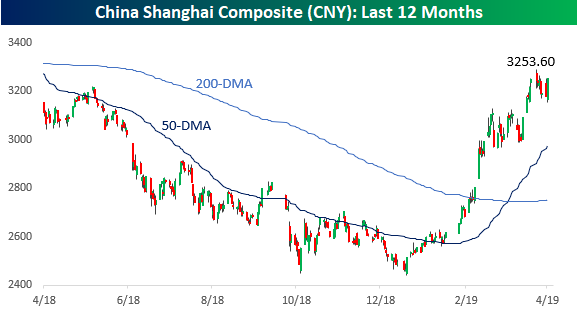 Interestingly enough, though, there have been five days since the start of April where the Shanghai Composite traded higher on an intraday basis, so it’s not quite a breakout from its recent consolidation phase. Start a two-week free trial to Bespoke Premium to see today’s full Morning Lineup report. You’ll receive it in your inbox each morning an hour before the open to get your trading day started.